It is possible that you have something called tarsal tunnel syndrome. Tarsal tunnel syndrome is a painful condition of the foot caused by pressure on the posterior tibial nerve as it passes along a passage called the tarsal tunnel just below the bone on the inside of the ankle. Symptoms include pain which is often described as a burning pain radiating into the arch of the foot, heel and sometimes the toes. Pins and needles or numbness may be felt in the sole of the foot. Pain may be worse when running or when standing for long periods of time and often worse at night. The area under the medial malleolus on the inside of the ankle may be tender to touch. A test to diagnose this syndrome is called Tinels Test. This involves tapping the nerve just behind the medial malleolus or bony bit of the ankle with a rubber hammer. Pain indicates a positive test. Sometimes it is initially mistaken for plantar fasciitis which also causes pain from the inside heel and throughout the arch of the foot. Tarsal tunnel syndrome occurs when the posterior tibial nerve which passes down the inside of the ankle becomes compressed or trapped. 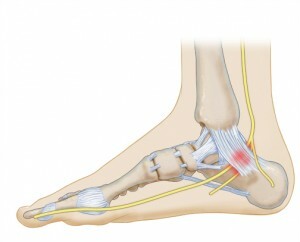 If you overpronate where your foot rolls in when you walk or run then this can contribute to compression of the nerve. Because overpronation is a key factor, it is common for the problem to occur in both feet at the same time. In people involved in running or running based sports, where the condition occurs spontaneously, then overpronation is the most frequent cause. Rest from any aggravating activities and apply cold therapy while in the acute phase when the foot or ankle is painful and inflamed. Your Doctor may prescribe anti-inflammatory medication to help reduce pain and inflammation.